Average Height	: 21" - 27"
The Chinook was developed in Northern regions ~ from a single ancestor. The sire of the breed, Chinook, was born to author/explorer Arthur Walden's Wonalancet, from New Hampshire on his farm in 1917. He was one of three pups born to a "Northern Husky" female, sired by one of his dogs. His dog was one of three pups born to a "Northern Husky" female, sired by one of the dogs on Peary’s North Pole team. 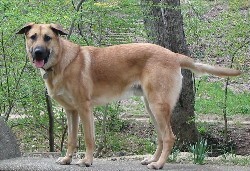 Initially the Chinook’s sire was a large, mixed-breed dog. Chinook was a "sport," a phenomenon of nature, not resembling either of his parents. He was an outstanding sled dog and accompanied Admiral Byrd's South Pole expedition in 1927. Chinook’s offspring, who inherited his coloring, size and general characteristics, were bred to combine the strength of the large freight dog with the speed of the smaller racing sled dogs. In the early 1900s, the Chinook set records for distance covered, loads carried and running time. This breed has been bred through the years by a small number of dedicated fanciers. The Chinook is a very rare breed. The Guinness Book of World Records listed the Chinook as the world's rarest dog in 1966 when only 125 existed. The Chinook used to be an outstanding sled dog, but in the 1980s the breed was almost extinct, with only 12 breedable dogs left in the world. Their sled drive is greatly reduced. They are much more companion dogs who are capable of doing any sort of work, but they really love sledding, skijoring and carting. This is a breed that has proven itself particularly good at carting because, unlike their Siberian and Alaskan counterparts, they are easily trained in obedience and can work very calmly in harness. Chinook fanciers are working to gain more recognition and are actively seeking sledders to work with the breeders in programs that emphasize the working qualities. The Chinooks New England Club is one of the affiliate clubs of the COA. They work diligently to preserve the breed. The Chnook breed is a dedicated, hard-working and versatile sled dogs. Performing their given task is their primary concern in life. In addition to sled-pulling, the breed also can be used for carting, obedience, flyball, search and rescue, and packing. Thejir build coupled with their agile movement and drive, make it a great agility dog. One of the key breed characteristics is the Chinook's temperament: calm, non-aggressive, with a willing, friendly disposition. Chinooks were bred to work in teams and should not exhibit dog-aggression. Notwithstanding its gentle, even temperament, the Chinook is a dignified dog. Socialize well to prevent them from being reserved with strangers or unfamiliar surroundings. In action, the Chinook is graceful but purposeful, alert but calm. Their expression reflects their intelligence & proud dignity. Most Chinooks make excellent pets for children, especially when the dog is raised with them (even with rough and tumble children). Most Chinooks tolerate children even when they haven't had any contact with them. These dogs are incredibly loyal. Given acres and acres of land, the dogs are generally going to be wherever you are; so having a lot of space is not a requirement, but you do need to take them for daily walks where they are made to heel beside or behind you, never in front, as the pack leader goes first. The Chinook needs to be close to its family and part of the family. They do not make good outdoor pets. The Chinook is generally good with other and all kinds of pets. They need an owner who is confident and firm with them, but not harsh. If you are passive with them they will become strong willed. They do need to be shown who is the "top dog". Chinooks are easily trained through positive reinforcement, but do not respond to heavy-handed training tactics. A calm authority in a way dogs can understand is best. They are very smart, and only need to know what you want them to do. Chinooks make fine apartment dogs so long as the owner makes a commitment to regular exercise and walking. They do not bark often and can be left reliably after puppyhood for periods of time. Unlike their northern breed counterparts, these dogs do not make good outside pets. This is a breed that shows extreme sensitivity and isolation from human contact triggers separation anxiety and other emotional turmoil. These dogs should not be kept in a backyard and should always be considered a part of the family. The coat of the Chinook practically takes care of itself and requires little to no grooming. Chinooks have a double coat consisting of a downy undercoat and a course overcoat. Some Chinook owners have reported their dogs shed twice a year for about a week; otherwise, they shed very little. Others have reported their dogs to shed heavily all year round. One owner said, "Kodi sheds VERY heavily almost year round (despite our regular brushing of his coat). Oz is also a shedder—although so far not as much so as Kodi. think whoever has a Chinook should be prepared for lots of dog hair throughout the house.